Do you experience back and neck pain after a long day at the office? The Ekornes Stressless Consul Office (M) is built with innovative technologies to offer full support for your back and neck. Backed by the American Chiropractic Association, your body will instantly feel supported the moment you sink into its plush, foam cushioning. The patented Plus and Glide systems race to support the lumbar region of your back and neck for proper positioning and alignment. Innovative Comfort Zones technology work hard for you to offer the best seating position every time. These technologies unite to offer you a better working experience with less distraction from back or neck pain. Sharp wood accents and a 360 swivel make this sleek office chair a necessary addition for any home or office. 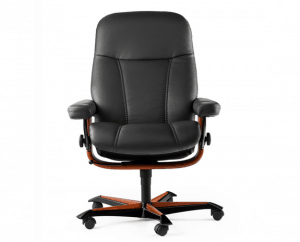 The Consul Office (M) is a perfect office chair for individuals of average height and stature. The Plus and Glide technologies cradle your neck and back to decrease back pain and improve your productivity in the office. The instant you sit down, Comfort Zones technology offer the ultimate balance of cushion and support so you can get to work. Use the 360 swivel and wheels to glide throughout your office with ease. The American Chiropractic Association proudly endorses Ekornes Stressless furniture for it’s innovative designs. No detail was missed in the making of the Consul Office (M). With smooth leather, padded armrests, and a sturdy frame, the Consul Office (M) will become your favorite piece of office furniture. Guard your health by protecting your back and neck with Ekornes Stressless office line. We ship to any address in all 50 United States. Ask for details regarding shipments to Canada. For quality assurance, all Consul Office (M) shipments must be insured for accident, loss, or damage. Once your shipment leaves our facility, a tracking number is provided via email. Unless otherwise stated, delivery means “to your door”. Shipments must be signed for by someone over 18 years of age. Ekornes has been creating furniture in Norway since 1934. In 1971, they launched the Stressless recliner using new technology to enhance comfort. Over the years, they developed the Plus™ system and Glide system to create a recliner or office chair that adjusts to the needs of each individual. The adjustable Ottoman completes the comfort of the Stressless recliners making them the premium recliner on the market.